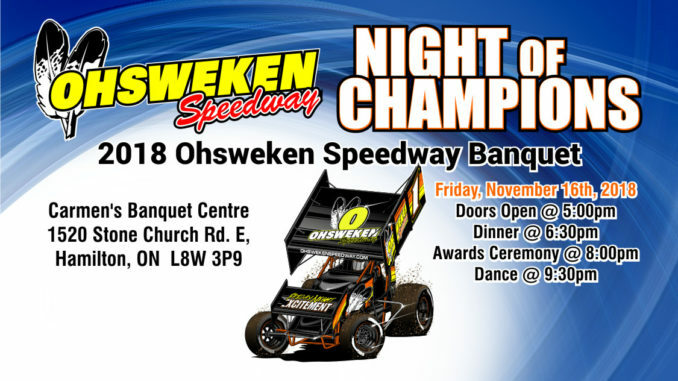 (October 23, 2018) – Ohsweken, Ontario – Ohsweken Speedway would like to remind competitors, staff and guests that tickets to the 2018 Awards Banquet will be sold until end of day Sunday, November 11th. Attendance numbers will be provided to Carmen’s first thing Monday morning at which point no tickets will be available. If you plan to attend please get your tickets as soon as possible. -$40 per person – Tickets are now available at Styres Gas Bar (cash only), or call Mary Wilkinson at 519-717-0023 between 4:30pm and 10:30pm to pay with credit card. PLEASE NOTE – All drivers who finished in the top 15 in 360 Sprints and top 10 in all other divisions in their championship points standings in 2018 are required to attend the banquet to receive their point fund awards.